Aquaculture Landscapes explores the landscape architecture of farms, reefs, parks, and cities that are designed to entwine the lives of fish and humans. In the twenty-first century, aquaculture’s contribution to the supply of fish for human consumption exceeds that of wild-caught fish for the first time in history. Aquaculture has emerged as the fastest growing food production sector in the world, but aquaculture has agency beyond simply converting fish to food. Aquaculture Landscapes recovers aquaculture as a practice with a deep history of constructing extraordinary landscapes. These landscapes are characterized and enriched by multispecies interdependency, performative ecologies, collaborative practices, and aesthetic experiences between humans and fish. Aquaculture Landscapes presents over thirty contemporary and historical landscapes, spanning six continents, with incisive diagrams and vivid photographs. Within this expansive scope is a focus on urban aquaculture projects by leading designers—including Turenscape, James Corner Field Operations, and SCAPE—that employ mutually beneficial strategies for fish and humans to address urban coastal resiliency, wastewater management, and other contemporary urban challenges. 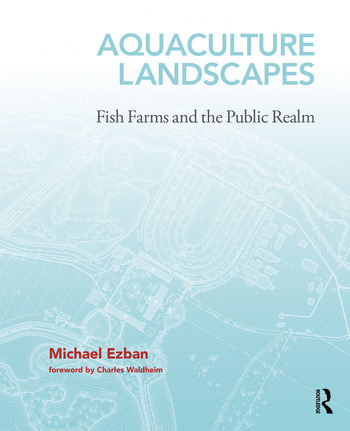 Michael Ezban presents a compelling account of the coalitions of fish and humans that shape the form, function, and identity of cities, and he offers a forward-thinking theorization of landscape as the preeminent medium for the design of ichthyological urbanism in the twenty-first century. With over two hundred evocative images, including ninety original drawings by the author, Aquaculture Landscapes is a richly illustrated portrayal of aquaculture seen through the disciplinary lens of landscape architecture. As the first book devoted to this topic, Aquaculture Landscapes is an original and essential resource for landscape architects, urbanists, animal geographers, aquaculturists, and all who seek and value multispecies cohabitation of a shared public realm. Michael Ezban is an architect, landscape designer, and scholar. His work explores landscapes and buildings designed to mediate human-animal relations. Published and exhibited internationally, Ezban’s writing and design focus on aquaculture landscapes, waterfowl hunting grounds, and equestrian facilities. He is a recipient of the Maeder-York Family Fellowship in Landscape Architecture from the Isabella Stewart Gardner Museum and the Charles Eliot Traveling Fellowship from the Harvard University Graduate School of Design. Ezban is a Visiting Assistant Professor of Landscape Architecture at Virginia Tech, and a cofounder of VanderGoot Ezban Studio, a research-based practice.